FK chats to Aura and Marena of textiles label Studio Bonnie. 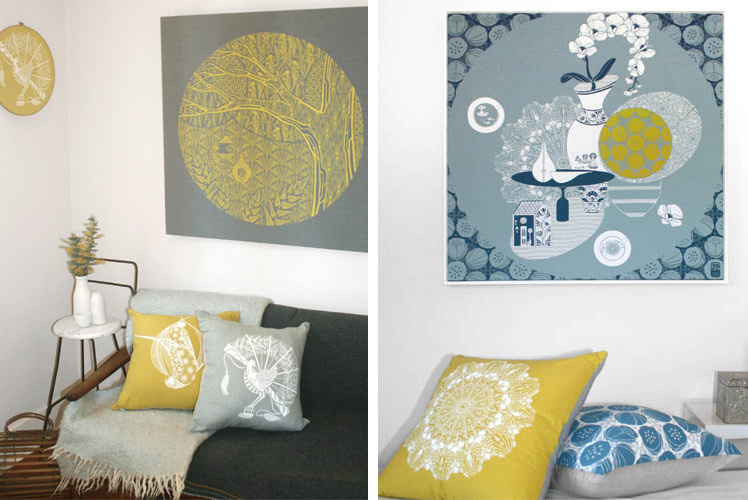 Together they create original and stylist screen printed homewares. Tell us a bit about Studio Bonnie and what we can expect to discover? 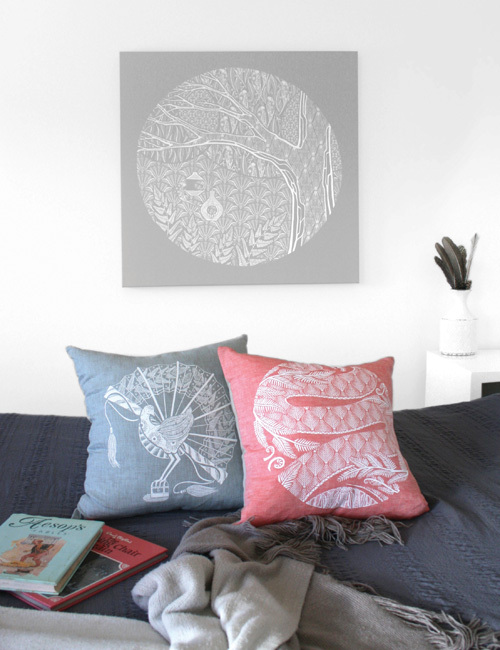 Studio Bonnie is a boutique design studio based in Sydney, founded by Aura Parker and Marena Von Behr. 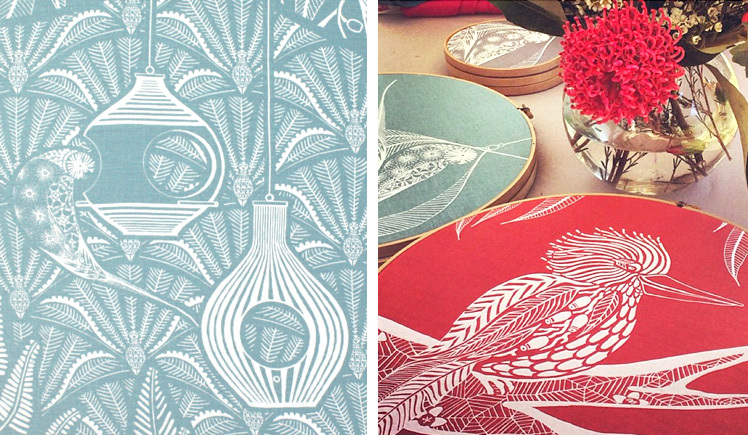 We make screen printed art and handcrafted textiles, full of intricate nature inspired patterns, playful details and things to find. 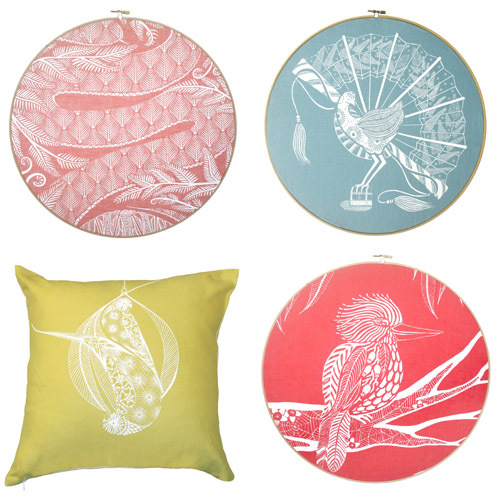 We print on beautiful, brightly coloured and naturally textured linens. 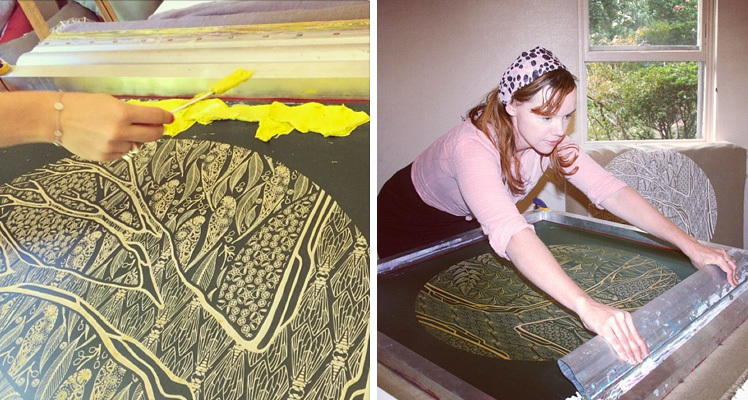 Our prints are handmade by us and take time and care to produce. 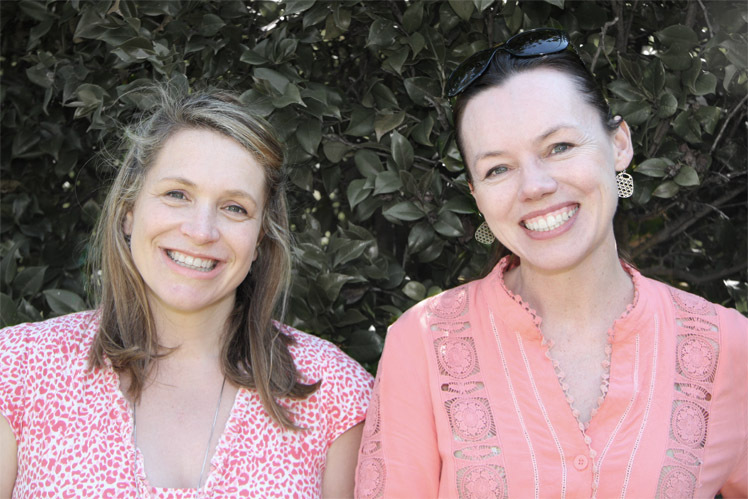 We are sisters-in-law and we get along really well, as we always had a common interest in art and design. Marena’s background is in corporate interior design and she always enjoyed the process of selecting fabric for clients and she happily transitioned to designing textiles. Aura is an illustrator, also working on children’s picture books, she worked as a freelance graphic designer for many years and her skill with colour and line translated beautifully to printing on fabric. A couple of years back we exhibited together with some design friends making our own individual art and we liked each others styles. We decided to collaborate on a design which became ‘The Busy Life, Still Life,’ we exhibited some more, then we just kept designing stuff and selling stuff and Studio Bonnie got busier and has really taken off. 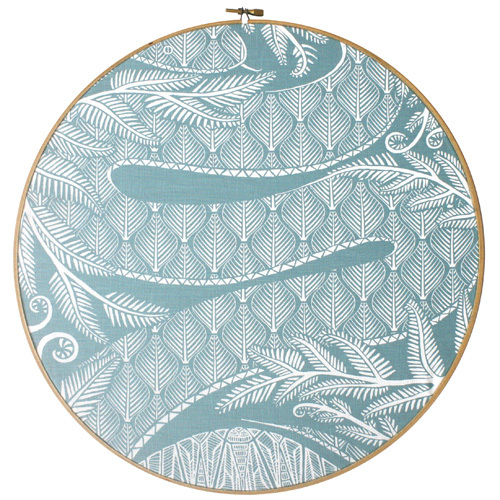 Studio Bonnie’s style has evolved over time and I think our work has become more intricate, we simplify shapes and turn things into patterns, it then becomes rich with detail. We choose colours that are complimentary to a space and patterns that draw you in. Our designs are inspired by the natural local environment as the printing studio is in Greenwich, a leafy suburb with pockets of bushland. We have lorikeets and lyrebirds but they aren’t ordinary birds as we explore different ways of representing form so they are made up of bush flowers and other things. As well as nature, we get a inspiration from our children and families, life rituals and objects from the past. Once we’ve worked out our concepts and have spent time sketching our designs we scan them in to Photoshop and Illustrator. Our creative space is spread out over two locations. T he digital side of our business happens at Aura’s art studio. The screen printing studio which we have outgrown is a room at Marena’s place overflowing with cushion inserts, ironing board, hoops and fabrics exploding everywhere, and some of our screens are enormous. We are designing a new space but we probably won’t get there for a year or two. The old radio is stuck on an easy listening station so we find ourselves jigging along to hits from the 80’s, not by choice, but we do have a lot of fun. We love exhibiting and seeing people interact with our work. We love the creative freedom of being self employed. Our goal is to make things we love and hope that other people will love them too. We love talking about colour and we are like kids in a candy store when we venture out fabric shopping – happily choosing linens for a collection. Our biggest challenge is probably time. W e both have young families and there is a lot to do for the business before we get around to the fun part which is the designing. Our lives are full. Full of good things. What new projects are you working on and where would you like to see Studio Bonnie in the future? Next year will be an exciting year for us as we are already sketching and exploring a new collection of designs around the theme of reflections and water. We will launch them at our contemporary textiles exhibition at the Incinerator Artspace in Dec 2015. We are going to do some digital prints on silk, and we may explore printing with metallic ink and some new ways of framing. We are also planning some really large artworks which will be limited edition prints in short runs and selective colourways. Most of all we want to create beautiful things, grow our label and enjoy the creative process. Find us on Instagram @studiobonnie to see what we are up to. Love your product particularly the yellow and grey, so looking to buy some for my little home in hobart!